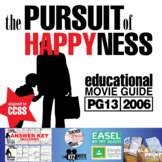 16 questions to accompany the film, THE PURSUIT OF HAPPYNESS (yes, it's spelled that way). Good for discussion, or as a video quiz while watching to check for attention and comprehension. This viewing guide asks students to respond to questions related to basic plot events as well as higher order questions and a writing prompt. 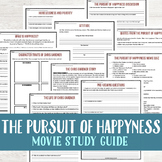 This movie guide goes along with the movie, "The Pursuit of Happyness". A story about an under privileged single father trying to become a successful business man. see the previewGet TPT credit to use on future purchases: Go to your My Purchases page. Next to each purchase you'll see a Provide Feedback button. Click it and you will be taken to a page where you can give a quick rating and leave a short comment for the product.MORE DEALS:100 WORD SEARCHES HERE!! Chris Gardner, the character portrayed by Will Smith in the movie "The Pursuit of Happyness," is interviewed by 20/20 (it is broken down into a Part 1 and a Part 2). The lesson provides links to the two videos, and contains eleven (11) higher level discussion questions that will engage students. 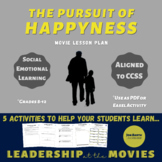 This worksheet can be used while students view the movie The Pursuit of Happyness. Topics such as soft skills, compensation, types of formal education should all be discussed prior to the activity. 7 question worksheet that deals only with content from the movie.